An odd thing happened today. Catriona said “why don´t you head out to the river? It´s a lovely day. I bet the fishing would be good!” In our house this kind of thing is pretty much unheard of. My hours at the riverside are stolen and often there is a price to be paid later. And yet today golden time was bequeathed to me by my better half! It was only as I was heading towards the Guadalhorce that I began to figure the motivation behind my wife´s magnanimous gesture. Today was an afternoon of international rugby fixtures and there was beer in the fridge. Suggesting that a fishing trip was on the cards was a cunning strategy to secure the telly and preventing the old man from sequestering the sofa and generally making a nuisance of himself. I have to take my hat off to that woman. Like they say, she wasn´t born yesterday! It rained heavily on Tuesday and I didn´t know what kind of condition the river would be in. It was carrying just a little colour. After only a short walk along the bank I came across an encouraging sight. 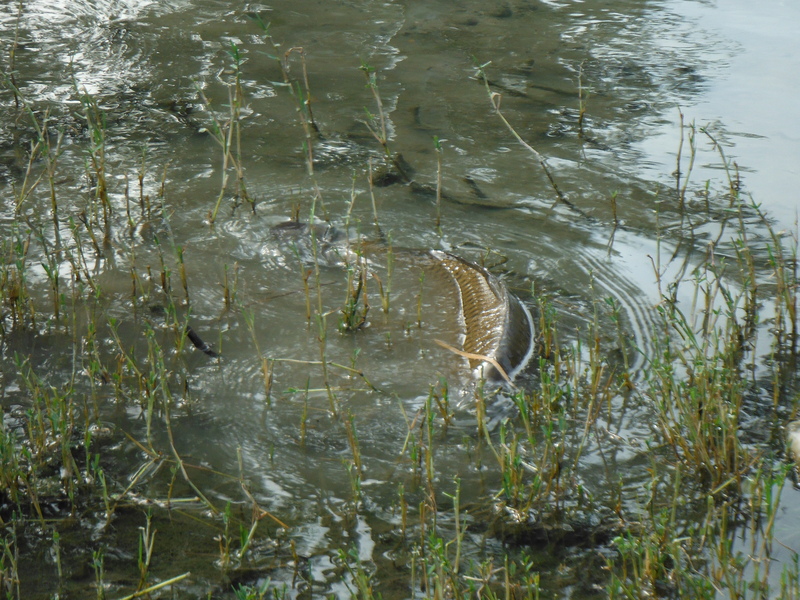 A carp was nuzzling into the vegetation in the shallows and part of its back and its dorsal fin were fully exposed. Out of curiosity, I walked to within a rod length of it and it remained oblivious to me. It was only when I tried to lower a nymph in front of it that it swam off. 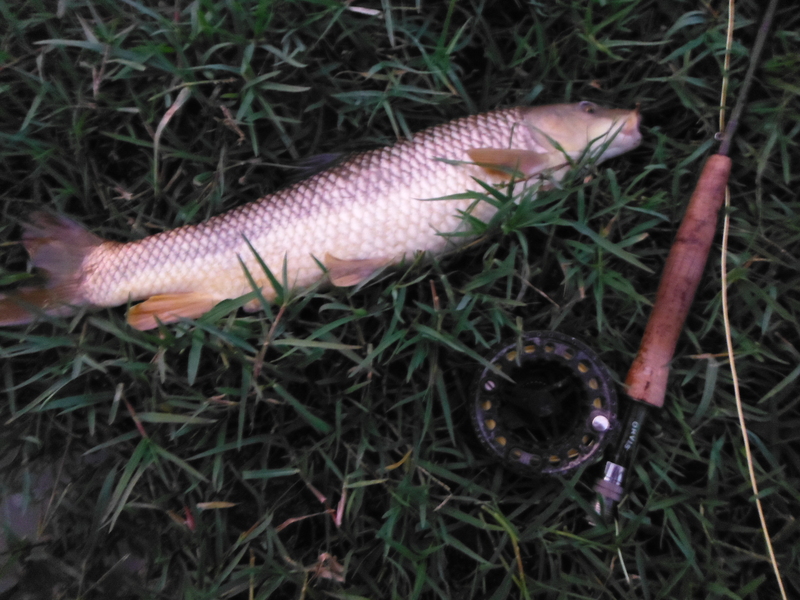 Despite the little colour it was carrying the river fished well. In the first stretch of river I managed to catch nine barbel and a carp, all on a fairly standard nondescript little nymph. As I was running out of daylight I thought I might travel a little way downstream and take a look at another stretch. 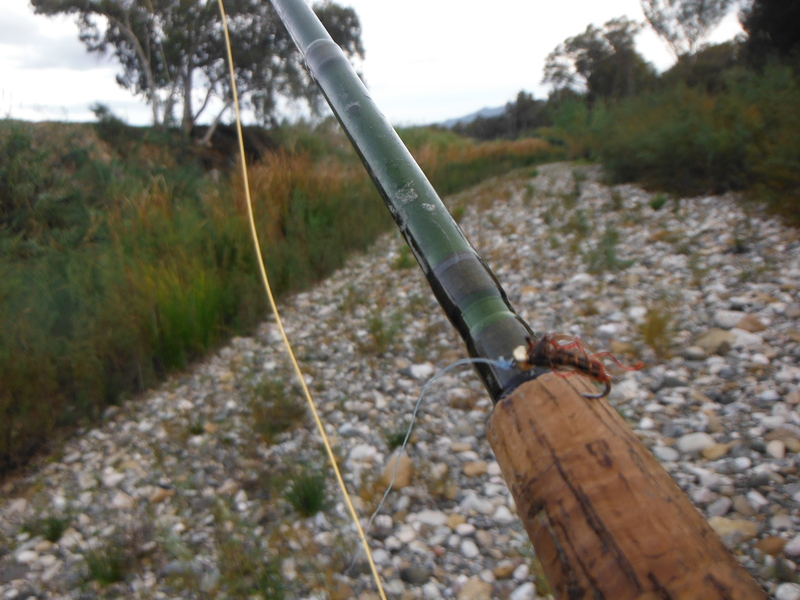 I was keen, if I could, to catch a tenth barbel. This doesn´t happen very often and, thankfully, I was lucky enough to fool one more. The light was too low to see this final fish in the water but I had noticed the wake of a fish was moving from a shallow riffle into a pool. I pitched the nymph just a little upstream and a swirl suggested that a fish had turned to accept it. This was not, as it happens, the fish I was after but another which must have been swimming alongside. No complaints from me though! What a day it turned out to be! I had enough in my pocket to treat myself to a pint in Villafranco on the way home and now, to top it all, I have the full time result of match between Ireland and South Africa: Ireland 29 South Africa 15. There are days when everything seems perfect. Christ, if I hadn´t had a couple of drinks since coming home I would go out and buy myself a lottery ticket! 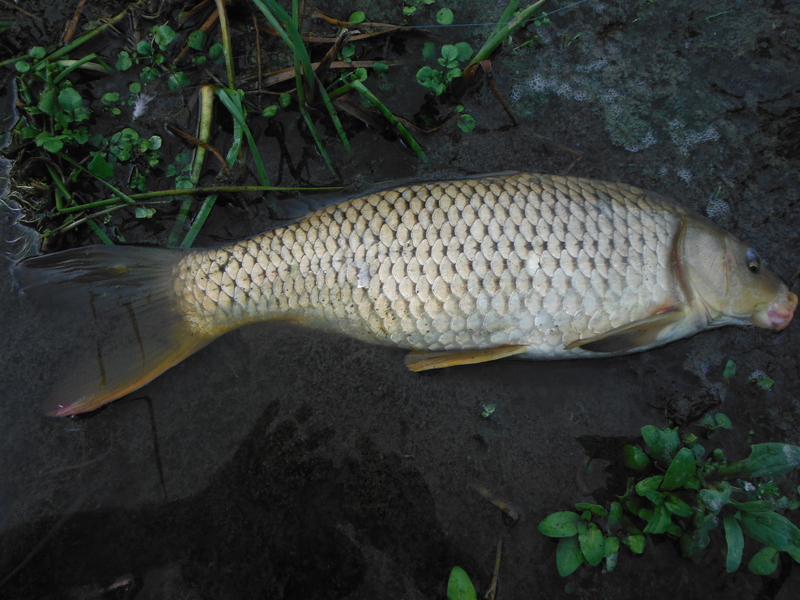 Often carp will feed in water too shallow for them to swim in! The carp in this river often seem to have an orange lower margin on the tail fin. This was my only carp of the day. 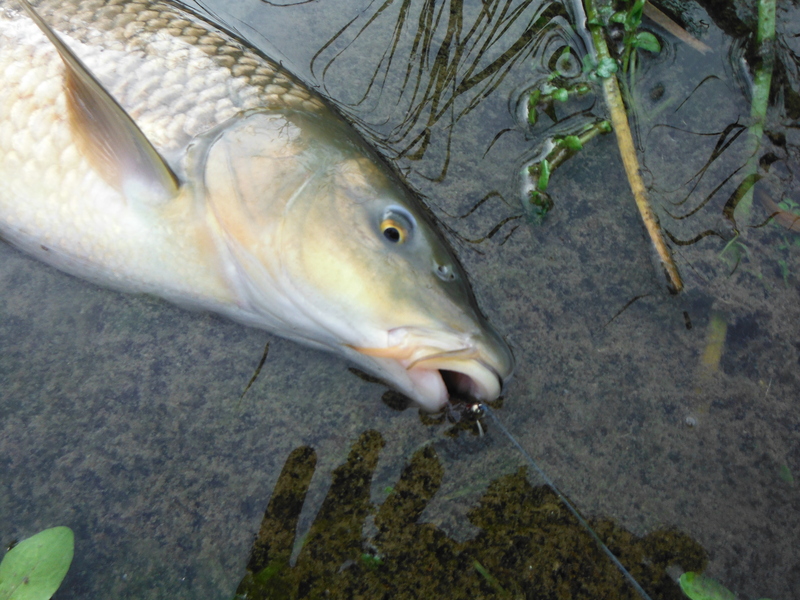 The barbel can be spooky but today they were feeding well. All the fish took this little nymph. It is looking a little the worse for wear here! Barbel number 10! A red letter day! It seems like you are getting some great fishing now the rains have arrived. I’m looking forward to getting back over there next year. Thanks for the comments on Boo’s book – I think you’d enjoy it – if you email me your address I’ll send it to you – its a great read. What I’m really waiting for is your fishing book – your blog is great and your paintings are out of this world, so the book should be quite something.